There is growing scientific evidence to support what ancient healers have known for centuries: the mind can play a powerful role in healing the body of even the most serious illnesses. Self-Care for Hepatitis C: Applied Meditations for a Healthy Liver is a one-of-a-kind program designed to address the challenges of hepatitis C and empower you to deal with them successfully. 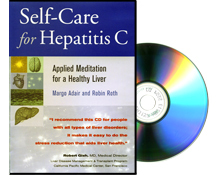 The audio CD contains easy-to-follow meditations and visualization techniques specifically created to address hepatitis C.